It's Monday morning on the interweb (it might be later in other locations, but it's morning here so...hah!!) time for your favorite game: What Am I? Determine the vehicle in this picture, win instant fame. Almost makes me think of a FOX mustang...but the wood and door card look too nice. Lincoln/Mercury Zeypher? The door-lock pull definitely looks '80s Ford. 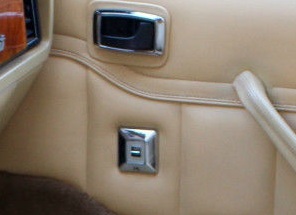 So does the sloppy latch-guy-didn't-talk-to-the-upholstery-guy way the pull surround overlaps the seam. The dash contour/vent location also looks '80s Ford. One of the more upscale Fox variants? '86 Lincoln Continental or something? Got lucky....like you guys, I knew that was Ford hardware, but didn't see them going with double-stitching, and the wood actually looked real. Oh God, careful with that link, once seen cannot be unseen. If you think that's bad, definitely do not search for images of the current Zimmer Golden Spirit 2-door. Yes, they are still in business. They now use the S-197 Mustang as a donor body! Like being unable to turn away from a horrific crash, I looked up the newest one. I hope the windshield washers spray eye bleach. I was late to the party, but I was guessing Jag XJ. Also Ford gear.